When I set banana as this month’s ingredient for We Should Cocoa, I didn’t have anything particular in mind, but with the run of wet weather we’ve been experiencing down in Cornwall over the last few days, I needed comfort and cheer. It had to be pancakes. Not just any old pancakes, but something a little luxurious which was also healthy, delicious and above all comforting, Banana pancakes it was then – with added ricotta. Oh! And chocolate sauce, of course. Pancakes are always comforting, so I had that angle covered. I thought adding ricotta cheese and smothering the banana pancakes with chocolate sauce would raise the game on the luxury stakes. For the healthy part, I made the pancakes with buckwheat and used the bananas and some creamy cherry and chocolate flavoured organic yoghurt to sweeten them a little. Using buckwheat flour had the added benefit of making these banana pancakes, gluten free. I made the chocolate sauce with 70% dark chocolate and maple syrup – oh and double cream too! Of course you could leave the cream out of the sauce if you really wanted to. Pancakes are easy to make, but as I was adding bananas and wanted a smooth light batter, I bunged all my ingredients into my much used Optimum 9200A Next Generation high speed blender. Twenty seconds on high speed and I had the smooth light batter I was after. It was then a simple process of pouring the batter into a lightly greased pan in suitable sized rounds. Smothered with chocolate sauce and eaten hot, these banana pancakes were scrumptious and definitely comforting. Despite the lack of sugar, they were perfectly sweet enough. Although banana was the main flavour, a delightful fruity note came through from the cherry and dark chocolate yoghurt. Healthy and gluten free banana pancakes made with buckwheat flour, ricotta cheese and yoghurt. Delicious on their own or smothered in chocolate sauce and scattered with almonds. Either place all the ingredients into a blender (I used my Froothie Optimum 9200A), or mash the banana well and whisk the wet ingredients into the dry ingredients. Leave to rest and get on with making the chocolate sauce. Place a lightly greased large non-stick pan over a medium heat and pour or drop large spoonfuls of batter into the pan. Cook for about 3 minutes and when bubbles start to appear on the tops, flip over and cook for a further 2-3 minutes. Remove from the pan and either eat immediately or keep warm in the oven until all are ready. Repeat the process until all the batter has been used. Place the cream, chocolate and maple syrup into a small pan and warm over a gently heat until the chocolate has melted. Stir gently until the sauce is glossy and smooth. Pour over the pancakes and scatter some almonds over the top. Cold pancakes can be kept for a couple of days and reheated in a toaster. These banana pancakes are my entry to this month’s #WeShouldCocoa. Not only are the pancakes very bananary, but they contain chocolate from the yoghurt and of course are smothered in dark chocolate sauce. Being healthier than your average pancakes, these would make a lovely weekend breakfast treat, so I’m sending them off to Made with Pink for Brilliant Breakfasts. Chocolate for breakfast? Why not? I do understand not liking bananas. They are a funny thing. I don’t mind the flavour, but I can’t eat a banana all on it’s own. these really are quite divine but it’s the chocolate sauce that quite frankly has me weak at the knees! I know what you mean Dom. Chocolate sauce makes so many things better. I had chocolate sauce on pancakes last weekend and make banana pancakes regularly so I love the sound of these pancakes. In fact banana pancakes has made manky old bananas in my kitchen seem so much more attractive. I’m thinking about WSC and hope to get something in because this is such a great combination. I’ve added bananas to pancakes before Johanna, but these ones were extra bananary – a fab vehicle for chocolate sauce 😉 I’m sure you’ll come up with something interesting and tasty. These look amazing! Love the idea of adding some ricotta into the mix and who can say no to a decedent chocolate sauce on top?!?!?! Oh wow, that chocolate sauce! Can I just slather it on everything?? 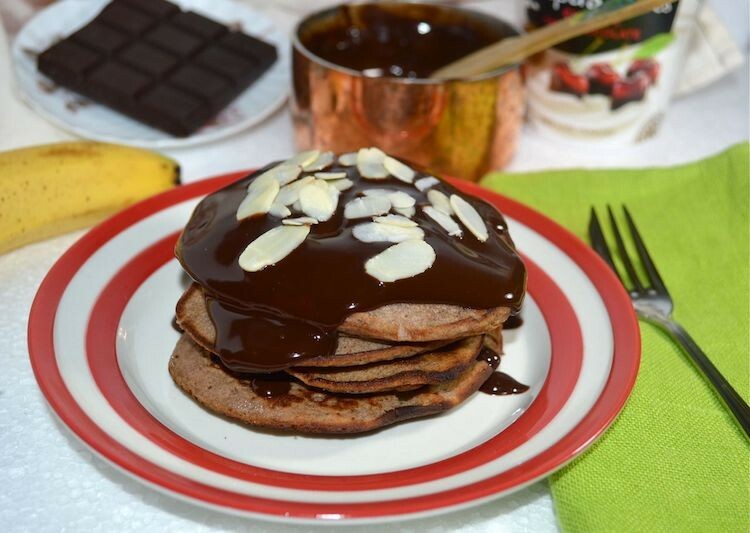 Chocolate for breakfast – these are definitely my kind of pancakes! I love the use of different ingredients like the yogurt and buckwheat flour. And that chocolate sauce well I’d probably use the whole lot on one breakfast for my self 🙂 Thanks very much for including my coconut pancakes and for linking up to Brilliant Breakfasts. I agree Jemma, they are a real treat and not something to have too often. I especially love the sound of that yummy looking chocolate sauce you’ve made to serve with the pancakes. Your chocolate sauce looks amazing – so glossy! Such an appealing combo, these sound super tasty. I’m going to try the banana ricotta combo! If you like bananas Kavey, it’s a good combination. I love the combo of flavour of those pancakes. The chocolate sauce makes them particularly tempting. I’m a big fan of banana pancakes, though I’ve never tried adding ricotta. And, I suspect if I made them with chocolate sauce it would end up being addictive! Well if you omit the chocolate sauce, these pancakes aren’t too calorie loaded and the ricotta makes them just that little bit more satisfying. Pancakes were one of my ideas and I’ve also gone for a breakfast theme. 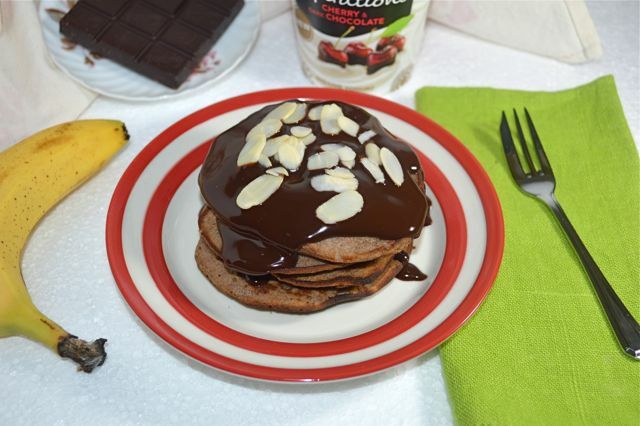 I love ricotta pancakes and yours with banana and chocolate sounds delicious. Definitely yes to chocolate for breakfast! Ah well I knew you’d approved of chocolate for breakfast Ros. Now what have you prepared for breakfast I wonder? Banana pancakes and chocolate sauce? AND gluten free? what’s not to love? Buckwheat is so good for GF pancakes and banana and chocolate are always heaven when sharing a plate. That sauce looks so rich and decadent! Yes, thank goodness for buckwheat pancakes, they are really really good. The chocolate sauce was the only decadent bit and if you don’t think cream is bad for you, well hey! Why am I not surprised there is a chocolate sauce on these pancakes perfect brunch!! the best pancake and chocolate.